When Chance the Rapper gave his victory speech for his hat trick at the Grammy Awards two Sundays ago, the hip-hop world was taken aback. “I claim this victory in the name of the Lord,” he said as he lifted his award for Best New Artist. In an industry where self-glorification is almost necessary for a young artist to get anywhere, Chance’s ascent to the top has been antithetical. Rather than celebrating his win by performing No Problems, the song that won him Best Rap Performance, he chose to turn the Grammys into a worship service with a cover of Chris Tomlin’s How Great is Our God, backed by Kirk Franklin and a huge gospel choir. Reactions, as you might expect, were mixed — both in hip-hop and Christian circles. …there are few acts more political than to wave the banner of God in a hostile public square. “I was once a huge Chance fan and now all the gospel and God talk has made me lose a lot of interest,” one Redditor said on the site’s hip-hop board. “His fruit show that he is not a Christian and doesn’t serve the God he references,” said a commenter on Rapzilla, a Christian hip-hop site. 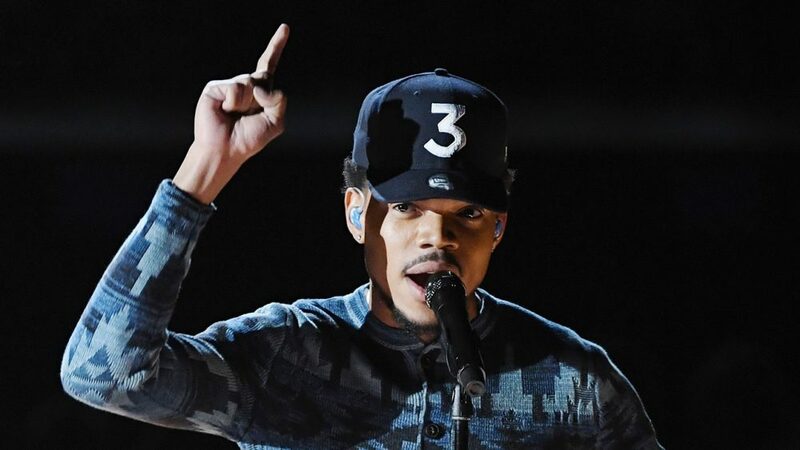 While Chance rides the border between evangelical Christianity and hip-hop, other celebrities are similarly championing God in their own industries. Andrew Garfield (of The Amazing Spider-Man fame) went through the Spiritual Exercises of St. Ignatius Loyola in preparation for his role as Father Sebastião Rodrigues in Martin Scorsese’s Silence, and inadvertently found himself drawn to Christ. 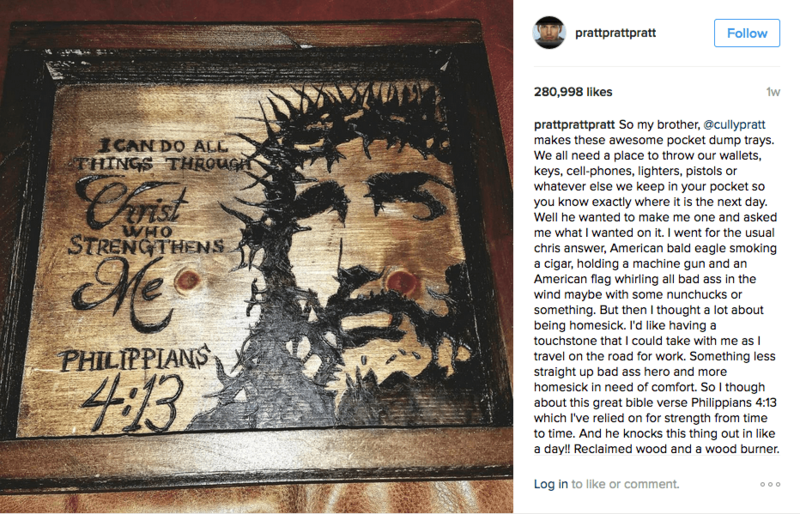 Across the Atlantic, Parks and Recreation star Chris Pratt proudly showed off a tray emblazoned with Philippians 4:13 on his Instagram a week ago — a verse which he “relied on for strength from time to time”. As popular culture becomes increasingly politicised, we might be tempted to think that these public declarations of faith or mentions of God by high-profile celebrities would be washed beneath the waves of agnosticism and political agenda. But there are few acts more political than to wave the banner of God in a hostile public square — to put aside all ideologies and political agenda in favour of magnifying the crucified Christ. Last year, Solange Knowles shone a much-needed light on the “pain and joy of black womanhood” as per Pitchfork’s review of her stunning album A Seat at the Table. In the same year, A.B. Original released Reclaim Australia, a ruthless, polemical, lyrical broadside on our national culture and the Indigenous people whom it consciously and unconsciously undermines. Atlanta duo Run the Jewels even chose to take the anti-Trump stance taken by their musical colleagues one step further, spitting heated bars against America’s political class wholesale. And throughout all of this, Chance the Rapper chose to speak the Gospel — a brazenly political act simply because of how unpolitical it was. Throughout 2017, artists like Chance, Garfield and Pratt will continue to hone their crafts. Some of their works will mention Jesus. Some won’t. And while it might be an entertaining exercise to dissect Chance’s next mixtape and criticise his use of explicit language or to question whether Chris Pratt really understands Philippians 4:13 and its context, they will continue to champion God through their flawed, human lives. The world is taking notice.